I am having several thoughts about how to use images. The use of computer altered photographs only works for me when they are needed for illustration purposes. In other words paired with the text of a poem or other linear narratives. They seem to require more than just computer manipulation to be associated with the maker. They need a context that reveals the particular artist’s voice. Otherwise they seem to be so much about the technology and not the maker and become ubiquitous in a way that I wonder if I haven’t seen it before. 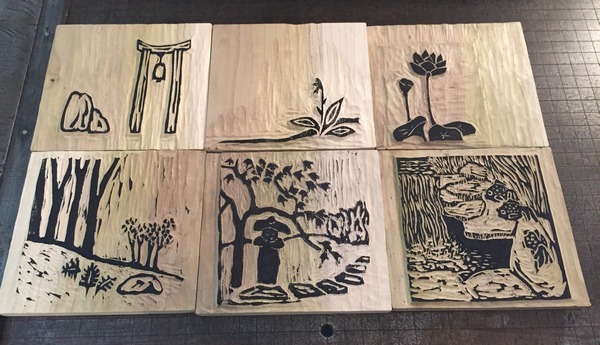 In reworking some of my wood blocks this week for the garden book, I looked at previous bindings that I have done and how I used the images to pair with the text. 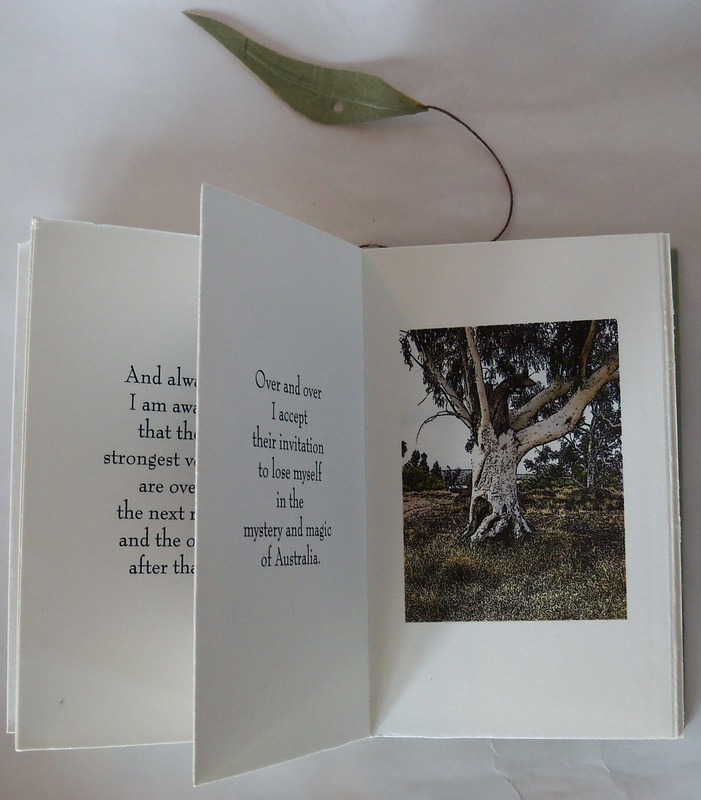 Small poetry books on Australia required me altering my own photographs via computer technology to get the “colored etching” look that I wanted to go with the narratives. Their bindings could be pulled out to view the vast landscapes of Australia which was another choice made to fit the content. Because the images are full of details that speak to the land of Australia, they are placed to the right and take precedence over the words. 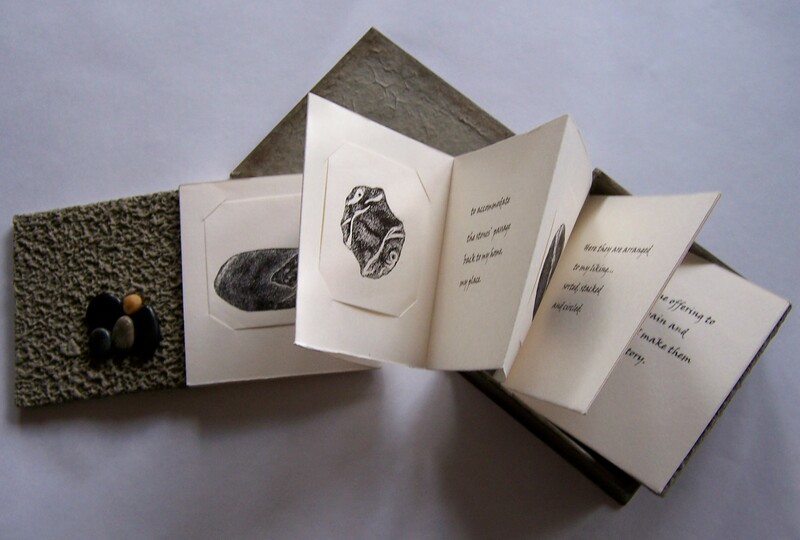 Whereas in other poetry books I have done, the simple block prints are only there in service to the stories and are continually placed to the left side throughout the book. It is a question of what is the priority I think. Here are samples of how that changes. 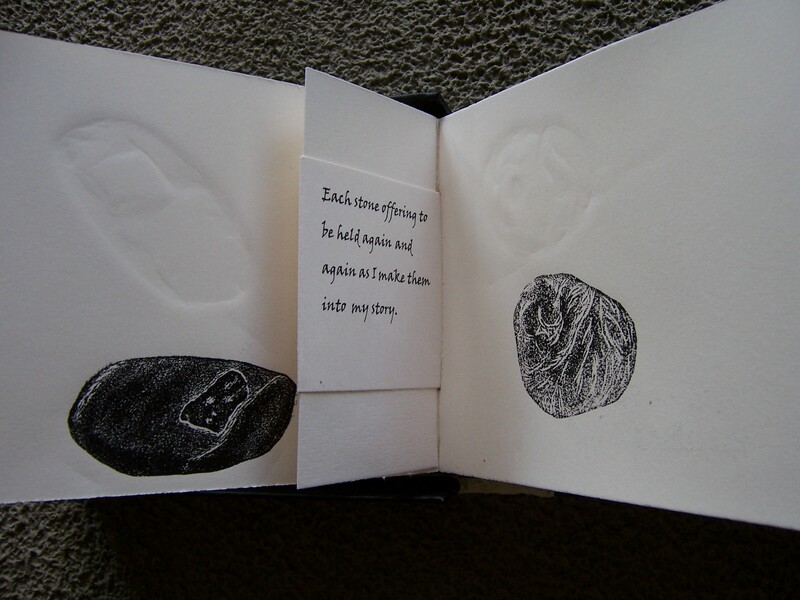 In illustrating my poem, “Stone Stories”, I made small wood engravings of some of my small stone collection and slit the left hand side to hold the images as the book is read left to right one page at a time or in this case can be pulled out into one long line of image alternating with text. 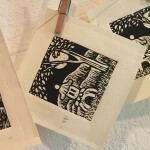 In the one below it the engravings were hand printed in conjunction with a collograph in its likeness at the same time. There was absolutely no room for error here or I had to start over. The text of the poem appears on the concertina binding that comes through the spine and is held in place. The viewer can not pull this book out but sees two images while reading two pages front and back. Obviously there was an extremely small edition of three of this one. And the one above was easier to make an edition of not more than six. The illustrations and text fit with each other in both cases. But here is a sample of how I used altered images another way. 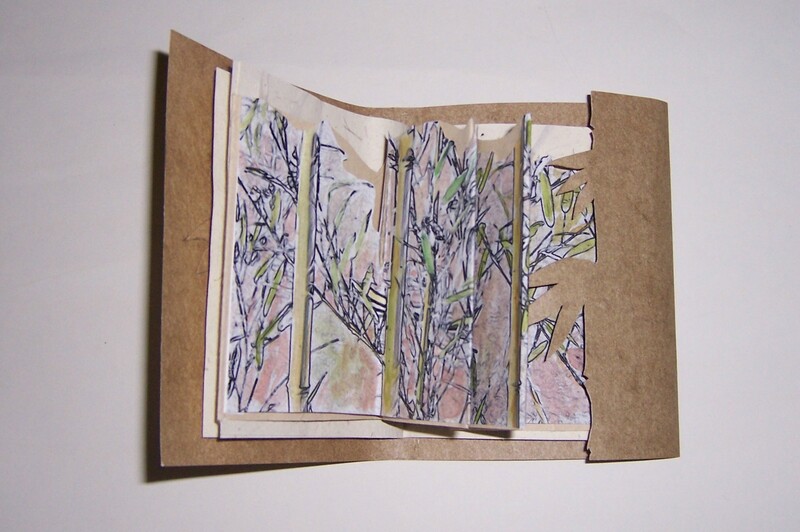 I was only interested in designing a binding that closed around the idea of a bamboo garden. I copied a photo of the bamboo into the computer and made several simple black and white copies after it was altered, back then it was a choice called “outline only”. Then I hand colored them and cut and pasted together in a long strip. Next I randomly made folds so that some of the bamboo came forward and others stayed back. It too can be pulled out to give the sense of standing in the bamboo forest. But the main thing for me was the bamboo suggesting closure that catches on itself. I followed it up with water garden book with a lotus as a closure and a sunflower closing another about what is behind a garden gate. They were fun to do and I learned a lot while playing with those ideas. And one more way I have used prints. 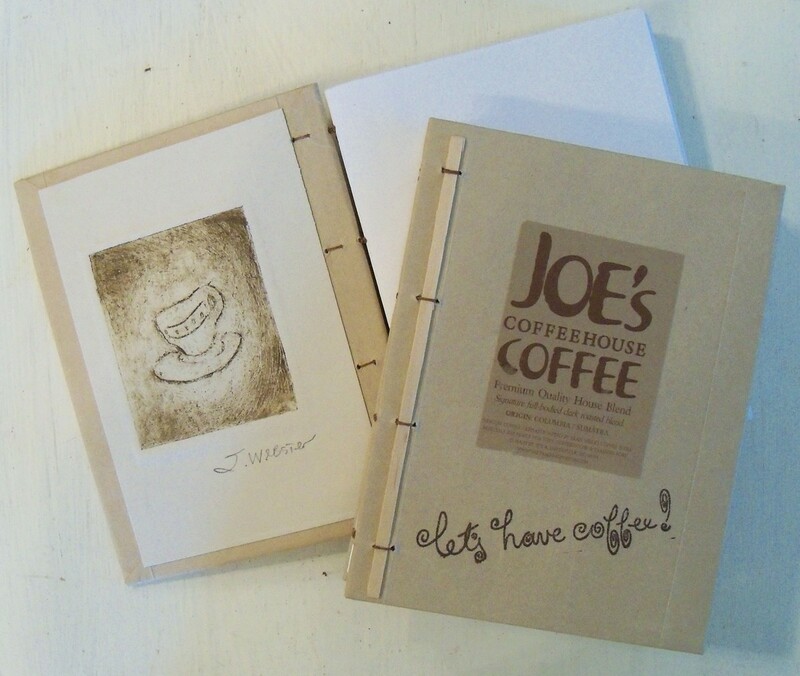 I used the coffee bag from a local coffee shop and one of his coffee stirrers in the binding of a blank journal for the owner and his assistant. 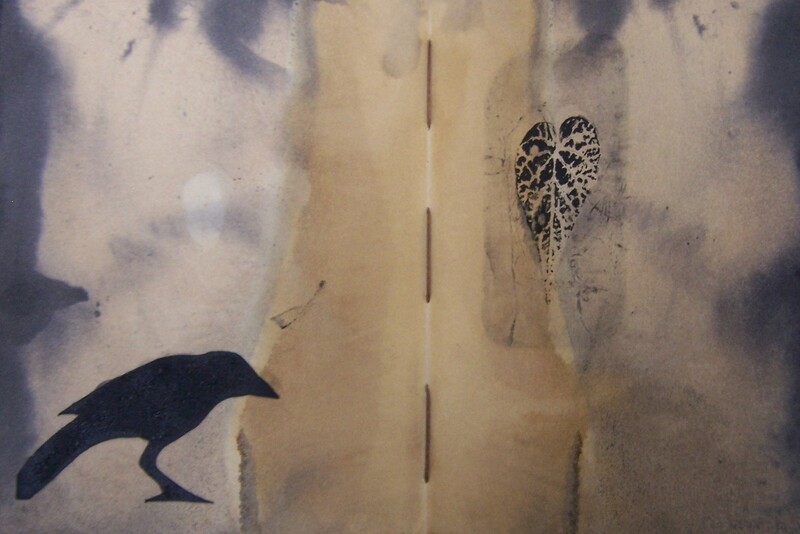 On the inside cover I used a collograph print that I still had from undergraduate school. When I originally made these prints they were in a series of all the ways I had been served coffee done on small plates and then printed in a spaced line across the paper. 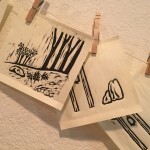 The point of all this posting of images and books and thoughts about computer generated imagery is that I am going to tackle something totally different and try to get my garden book using the wood block images to open up into three sections that make the viewer feel they are actually in the garden. I plan to cut away some of the small images to be spaced in front of the background images. I have no idea if it will work nor do I have a plan for binding this small edition. All I do know is that it will take careful planning with measurements and functionality. More on this when I proceed. 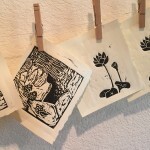 Now I am off to the North Carolina Soils and Water Conservation International Conference to introduce others to earth pigments and printmaking. 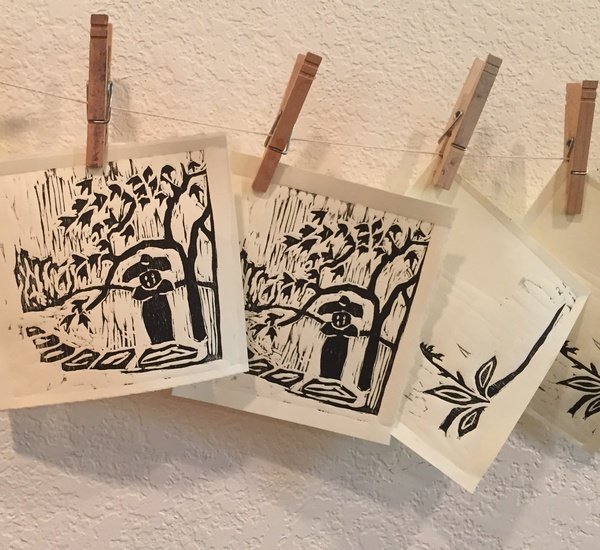 Today I am printing the wood block for the Japanese Garden Book. The etching press is leaving some nice marks on the pages that will be trimmed and placed one in front of the other. 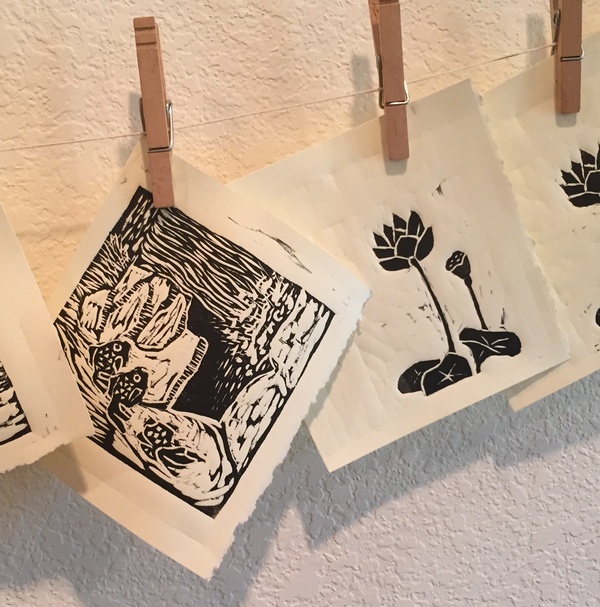 It never occurred to me to clip my prints to a line until I saw it done in the studio of a print maker I follow on facebook. I always looked for flat surfaces and hoped the cat would keep off them until they dried. Such a simple solution this is. When a person works alone in the studio just doing their work, it is easy to just keep to the old ways of doing without even wondering if there is a better solution. Just keep working, keep working. I am still not sure on the binding but at least can see how they will look when printed. Next week I will size them to just fit into their separate windows and just hope that what I see in my head can happen. Otherwise I will figure something else out. Here are close up views as they will be paired with an extra print that may be the cover…..not sure about that yet. This is what I am planning now for a limited edition of books on the new garden. The larger blocks on the bottom will be the background image, then about 3/16″ in front will be the top image cut around to reveal the background and give the triptych a depth that will make the viewer feel like they are in the garden. It will fold out to three sections. I plan on using my etching press to print the images and hope for some additional depth by way of deeply pressed images. 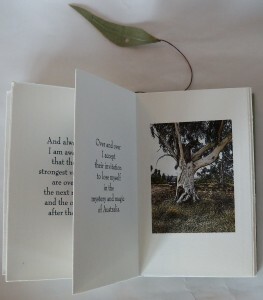 And then it will be a matter of getting them cut just right and designing the book to accommodate the three sections. Then the cover material and the closure that will likely be a trimming from one of the Japanese maples out front. If nothing else, I am learning my limitations and need for further practice, or instruction, on the craft of carving wood blocks. But the sound of the tool removing the wood is an addictive sound….scritch, scritch, scritch….something like that. More on this work as I proceed. Next week I will write a bit about the trip for the North Carolina Soils and Conservation International Conference in Greensboro. All those watercolors I made for it are drying nicely. 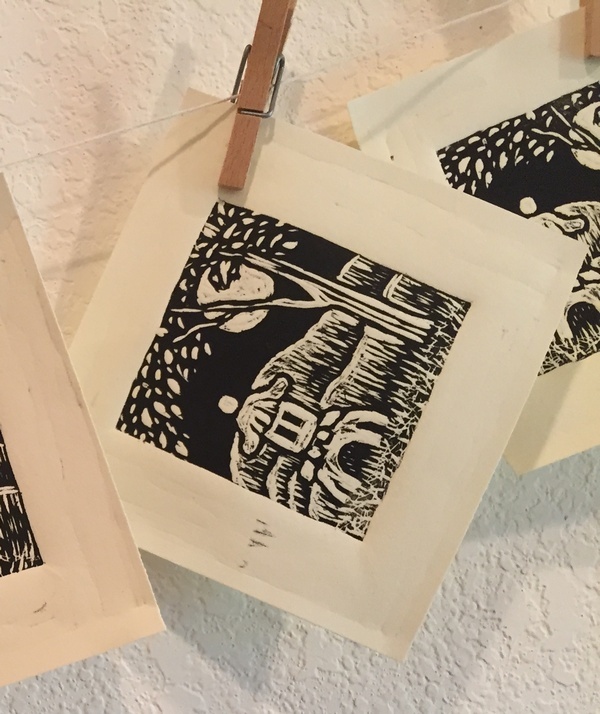 And a small note on the last blog about Teaching Workshops. Some people have actually said they are flattered to be copied, others that they find it pretty disheartening, but the vast majority are like twenty-five years ago…..quite silent. But thank you to those who have at least passed it on. Are artists/craftsmen supposed to spend all that time and not put their work out there? Putting it out there is what is making a living for many of them. Teaching workshops on how they got to that point is also a source of income for them. So yes, we are going to put it out there. Where there is a problem is with those who do not put the efforts into developing their own work when it is so much easier to just copy what is there. They might feel entitled to whatever the instructor has done by simply enrolling in a class. It is all there for them to use as they see fit. So let’s look at how easy this is to do by taking some examples of popular workshops being taught in venues that cater to classes with “product” as the goal. Note that I am saying the reason the students enroll is because they are assured that they will make at least so many of “these things” in an allotted time. Now if the instructions are handed out with each step toward that goal made perfectly clear, (preferably with illustrations by way of drawings or better yet, photographs), there is a certain guarantee that those goals can be met…..in the class and long after it’s over. Add to that, to make sure everyone is totally happy; all the same materials are included. In other words, in a book arts workshop, all ten students will have three blank journals with a mass-appeal decorative paper cover and marbled endpapers. How simple is that? And now you will likely have a percentage of that class planning on ways to alter what they learned by redoing the handout, changing to another size book with different popular papers and preparing their proposals on the way home from class. I know this sounds cynical. 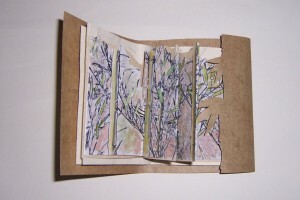 But in the field of book arts it is easy to do. Most of the techniques of book binding are pretty well known and well documented via instructional manuals, internet and the friends who showed you how to do it last week when they took a class you couldn’t attend. In a perfect world it would be nice to credit their instructor as they pass on what they learned, but seriously, were their instructors the ones who thought up these books in the first place? Not likely. So much has been out there for so long now; it is a bit difficult to pin that information down unless it is an exceptionally well-known person in the field. That is why I have seen few people take these unique workshops and then go out and teach it. Personally I would rather buy one of those instructors’ books than have a copy with my own name in the back. Some might even be so proud of their work done in that instructor’s style and class that they will enter it into a juried exhibit; which is another violation of ethics that seems ridiculous to still be happening. And still others have told me in the process of taking a class from one of those instructors with a well-known style that they learn so much by watching his process. That is a big difference….teaching a process…..not a product. By taking a class based on process over product so much of what we learn can be applied to our own studio practices. We are not overly concerned by how the end result looks or for that matter if there even is a physical result when class is over. 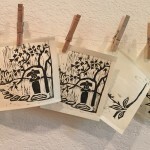 Those who teach painting, printmaking, weaving and other technique-based classes don’t seem to have the same problems as those who teach toward a specific product. You simply can’t guarantee that ten students are going to make the same lovely watercolors, well executed editions or number of fine scarves by the end of the class. There are too many variables based on the abilities of each student. But each and every one of them will have learned the processes they need to be familiar with to get better at what they are doing. And shouldn’t that be enough? How many of these students do you think are going to be able to take these classes one time and plan their proposals to teach it on the way home? They will need to spend much more time in their studios to even come close to being able to consider teaching these techniques. Of course, some instructors can help them get there sooner by giving out specific well-illustrated handouts but there is nothing like experience to help out the student who has questions and expects answers. The mistake, the BIG mistake that artist/craftsmen make is thinking that they need to teach their signature work. 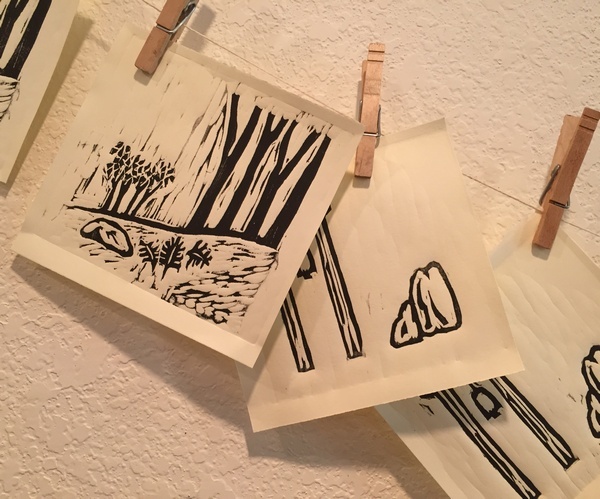 ….the pieces that have made them recognizable in their field…..the one piece that potential students have seen in publications, on the internet and in fine galleries….and is therefore guaranteed to fill their classes. It is too bad to see this unique work cease to be; seeing it offered up by someone from the class or someone who figures it out from a video or photograph. It’s not the same, but close enough, close enough to even use the originator’s name and say it is an “homage” to the them, their inspiration. This has never happened to me that I can remember. Well there was that time over thirty years ago when someone copied a little book I had paid a printer to do on basket making. They copied each page, stapled them together and sold them for more than my $6.50. My printer told me to use his lawyer who sent the person a letter to stop and desist doing this. And I got a letter from them saying I had ruined their career. I had put it out there; they had bought a copy and made their own. They were entitled or so they thought. Now there is nothing I do that someone wants to copy. My exhibition work is too involved, my book forms follow their content, and my sculpture uses pieces that I don’t even know where it came from; and all of it tries to keep up with a mind coming up with ideas it honestly thinks need to be fixed in a visual form. As for myself when it comes to teaching, I keep the class description full of process and little if any mention of pieces produced in the allotted time. I never give handouts other than a syllabus of each day’s goals for morning and afternoon. I encourage them to take notes if they want something in print because they will be better at using the words that will make what they are doing clear for later use. I used to hand out a bibliography because there were so many books available on the subjects relating to my workshops like “collections”, “containment”, “space”, etc., but now there are too many and who reads books that much anymore? But once the students arrive and are looking at me to share some incredible insight, I ask what they, each one of them individually, wants from the class. Then I proceed with seeing that they get it. It’s the way I teach. We are all going to learn together how to get the results we want and all the possibilities we can on how to get there. So this is just about all I have to say on the subject other than it is too bad that so much of others’ efforts are so easily taken for granted and used for the self-promotion of those unwilling to put in the time to make their own mark.